It is not uncommon for squirrels to go looking for food in someone's yard. The problem with this is that squirrels can do damage to your property. They can dig up bulbs or get into the walls of your home and chew on the wiring. They also carry ticks and fleas that can be left behind in your grass. When your pets go out to play, they will become infested. 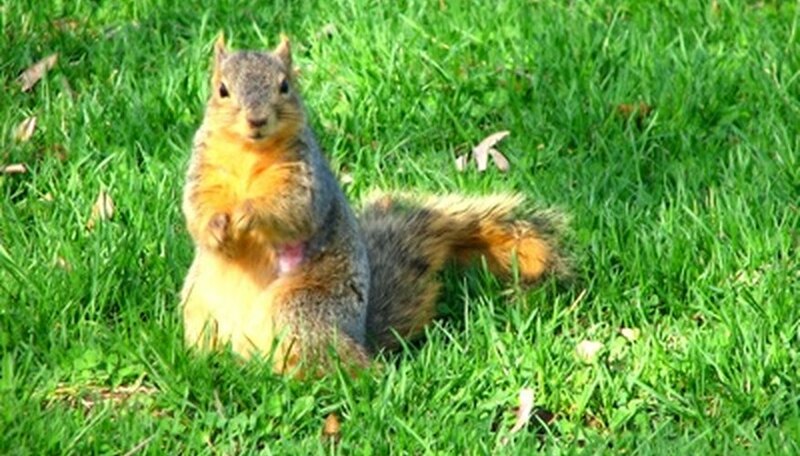 It is a good idea to get rid of the squirrels as soon as you notice that they have a fondness for your lawn. Remove all sources of food from your lawn. This includes bird seed and bits of food from your garbage can or your grill. If there is no food available for the squirrels, they will begin to look elsewhere. Install a fence around your flower and vegetable gardens. You can use a wire mesh fence or an electric fence. In order to be effective, the fence must be 6 inches below the ground and 30 inches above the ground. Use a squirrel repellent to keep the squirrels from ever setting foot on your lawn. There are two ways to go about this. You can make your own repellent with cayenne pepper, or you can purchase fox urine. Both are effective repellents. Sprinkle the cayenne pepper or spray the fox urine around the border of your property and near plants and vegetables. Set out a trap for the squirrels. You can get one at a hardware store. Place a few apple slices or a handful of peanuts into the trap and then wait for the squirrels to set the trap off. Put the trap in your car and head to the nearest park. Let the squirrels go there. Make sure you keep branches trimmed back so that the squirrels cannot jump onto your roof. Poisons are not humane and are not a recommended method for removing squirrels from your yard.